Kabaddi is a game involving two opposing teams that take turns sending a “raider” to the opposite side to tag a member of the opposite side and make it back without breathing. To show that no breath has been exhaled during this exchange, the raider will continually say “kabaddi” to themselves, while having to fend off approaching opponents who will try to prevent their escape back to their home side. The inclusion of kabaddi is an incredibly interesting device, reflecting Kadota’s fight as well as the gang mentality in Durarara!! as a whole. Like the game kabaddi, this series is comprised of groups that are constantly eyeing each other, waiting for the opportune time to strike. All it takes is for one person to make a move for things to get violent. In Durarara! !, we can always count on Izaya to create havoc in Ikebukuro. He’s like a more cowardly version of Gotham’s Joker. Thanks to his messages, Rokujou’s girlfriend and three other girls end up getting kidnapped by a gang of unsavory individuals from the first season. Thankfully, Mikado comes to the rescue! 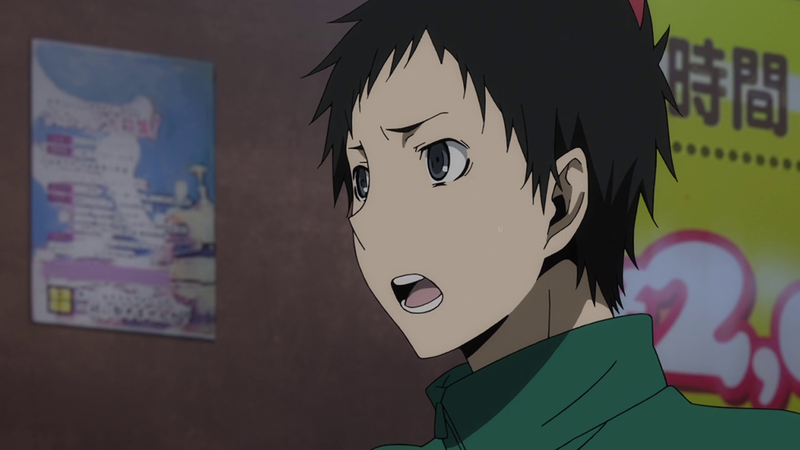 Except unlike his buddy Masaomi, Mikado’s kind of helpless in a street fight and gets handily beat up. 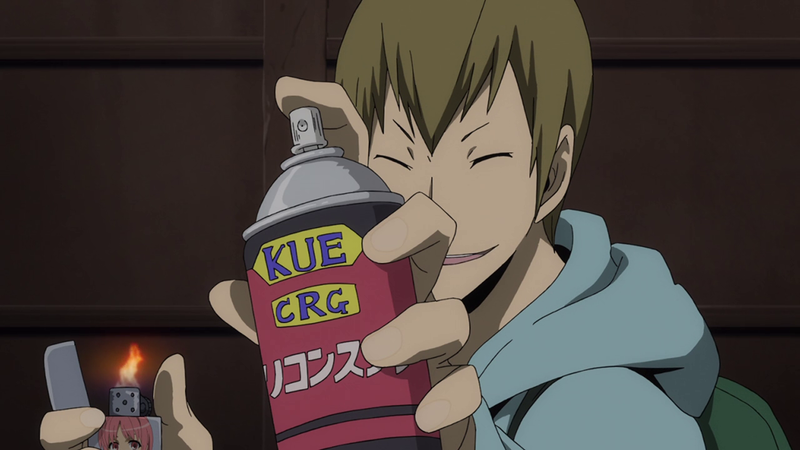 However, this leads to what I think might be the coolest moment of Durarara! !x2, which is when Anri comes to not only save Mikado but to defend him from Vorona. 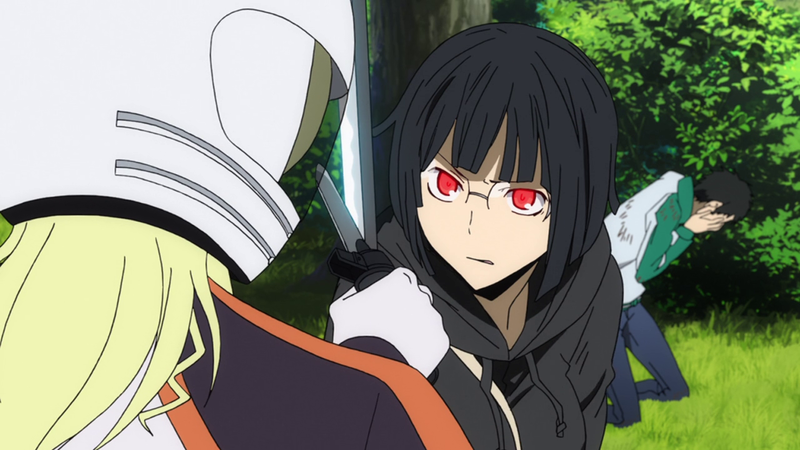 There are plenty of physically strong female characters in anime, but I feel like we don’t see this dynamic enough because here Mikado is seriously defenseless, and Anri may very well be the most powerful being in Ikebukuro with her deadly sword Saika. Vorona obviously doesn’t stand a chance against Anri, but the drive that compels Vorona to move towards danger makes her a really interesting character and is part of the reason why she may be my new favorite in the series. As much as I liked the episode, it doesn’t really feel like it’s building up to a big climactic conclusion. The ends of both arcs in the first season felt much bigger, and that may be because the story was spread across less characters. While it’s cool to see Walker bust out a Komoe-sensei lighter, it was much more exciting to see him torch an entire car. I’m not saying I need a bunch of pyrotechnics, but I felt that there was less impact in the intersecting of events this time around. However, as has been the pattern lately, the use of voiceover continues to impress me and probably makes up for the underwhelming meshing of plot with great thematics. Multiple characters pitch in their definition of what it means to be a member of the Dollars, and that in itself is a great example of the freedom granted only through the colorless gang.